Welcome to our 3rd Grade Math Problems. Here you will find our range of challenging math problem worksheets which are designed to give children the opportunity to apply their skills and knowledge to solve a range of longer problems. The 3rd grade math problems on the sheets are longer math problems designed to encourage children to use a range of math skills to solve them. searching for all possible answers. At third grade, the problems are starting to become more advanced with children needing to become more systematic in their approach and experimenting using trial and improvement strategies. Bikes and Trikes is an activity to encourage children to work systematically and find all possibilities for the number of bikes and trikes at a show. Captain's Coins is a 3rd grade math problem activity involving sharing out a pile of coins according to certain rules. This activity is good to use for developing trial and improvement strategie. The Broken Calculator problem is a number problem involving using an imaginary broken calculator with only the 3, 5, +, - and = buttons working to make different totals. Color that Shape is a coloring activity which uses logical thinking to work out which shape needs to be shaded which color. Dilly's Eggs is an activity involving counting in different size steps. The aim is to work out how many eggs Dilly had from two separate rules. It is a good activity to develop systematic working and the use of lists or tables to solve a problem. Frogs in Ponds is a 3rd grade math problem activity which involves using trial and improvement and logical thinking to get the correct number of frogs into each of the ponds. Join Me Up is an logical puzzle where the aim is to place the numbers from 1 to 7 into the puzzle so that no consecutive numbers are next to each other. Place It Right is a place value activity designed to get children thinking hard about where to put the beads on a place value abacus to get numbers closest to a specific total. 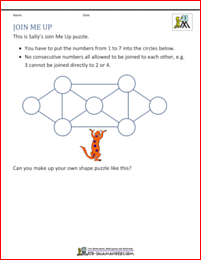 Sally's Rectangular Puzzle is an adding puzzle where the aim is to give each circle a value so that the sides of the rectangles add together to make a given total. Sally's Fruit Punch is a scaling problem involving changing a recipe for fruit punch for one glass into a recipe for ten glasses. In the challenge, you have to firstly work out the ingredients you need, and then work out the cost of the ingredients. This challenge is great for developing real-life math solving problems involving money and measures. Share the Treasure is a fraction sharing activity where the aim is to share 24 bars between a group of pirates. It is a good activity for developing fraction problem solving. 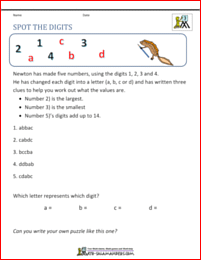 Spot the Digits is a logic activity where children have to find out the values of the letters a, b, c and d. The values can be determined by using the 3 clues. The Rock Race is a number activity which needs some perseverance to complete. The aim of the activity is to try different routes around the 6 rocks to determine which route is the shortest. The Three Spiders Problem is another problem which involves finding all the possibilites. The aim of this task is to find all triples of odd numbers that add up to 23. Good for odd and even practice as well as adding three small numbers together and strategic thinking. Looking for some easier math problems? 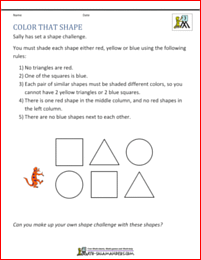 We have a range of easier word problems at our 2nd-grade-math-salamanders website. Many of the problems, e.g. Place It Right, Pick the Cards and Share the Treasure have easier versions on this page. Using the link below will open our 2nd grade site in a new tab. We have a range of more challenging word problems on our 4th grade problem solving page. Some of the problems, e.g. The Rock Race and Share the Treasure have harder versions on this page. Looking for some more third grade math problems?